Little Red Canoe is a new Canadian children's book subscription box designed to "create reading adventures to engage kids and get them excited about spending time outside." Sebastian just joined Beaver Scouts, and I thought that, continuing along that theme, he may really love the Little Red Canoe box and the inspiration it has to offer. 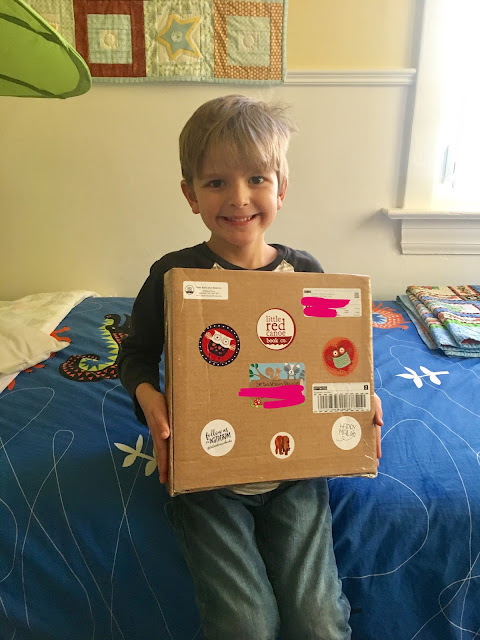 He was so excited to receive this box, most especially because the box itself was so decorated!! * PLUS an additional surprise (just for fun!) - Sebastian's surprise was a notebook. My five-year-old LOVED the pencil crayons and colouring postcard. I couldn't even take any pictures before he got down quickly to work. "Read me the book while I colour, Mommy!" The boxes are personalized to the children receiving them, and the hardcover books are such a special touch to this book box. A new book box theme is released for each age group every two months. The cost is $29.99 for one box. Then there is a 10% discount for 3 months, and a 15% discount when you subscribe for 6 months. Shipping is extra. I'm sure I got more out of the author and illustrator letters than my little guy did, but overall the value is pretty close to the cost of the box. If you have a little one that loves being outside, Little Red Canoe is the perfect gift! Visit their website to see their November and December themes! They are currently offering a 10% Halloween discount on all orders placed before October 31st. Disclaimer - We received a complementary Little Red Canoe box for review purposes. All thoughts and opinions are true and entirely my own.